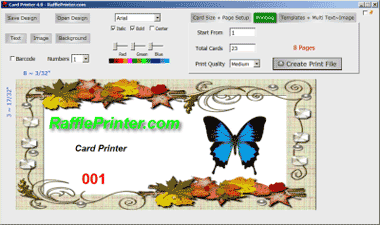 Select a suitable card size form the 'Layout' drop-down and select 'Swing Card' from the 'Templates' drop-down to draw Swing Card guide lines on the designer. The center rectangle is the 'swing' section that rotates as the card is opened, so you'll need to create a second Swing Card design for the back. 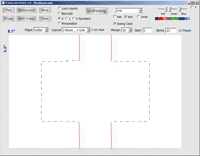 Design the entire back of the card, or just the central rectangle that swings into view when the card is closed. 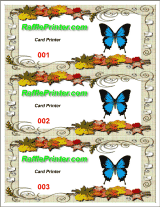 Once the fronts of the cards are printed, turn the pages over and print the backs with the second (back) design. The center rectangle on the back is in view when the card is closed. After printing, cut the solid guide lines, then fold the dashed guide lines (not the central rectangle), to create the Swing Card. Personalized Individually Named Swing Cards can add a great touch to a special occasion. Watch the short video to see how a finished Swing Card works, and where to cut and fold.